Two heavy barges the size of soccer fields that broke loose of their moorings early Wednesday are believed to have caused at least $1 million in property damage, police say. Sgt. Jason Robillard of the Vancouver Police Department told reporters at a press conference Thursday the barges were moored in North Vancouver when they came loose just after 5 a.m. and floated across Burrard Inlet toward Coal Harbour. 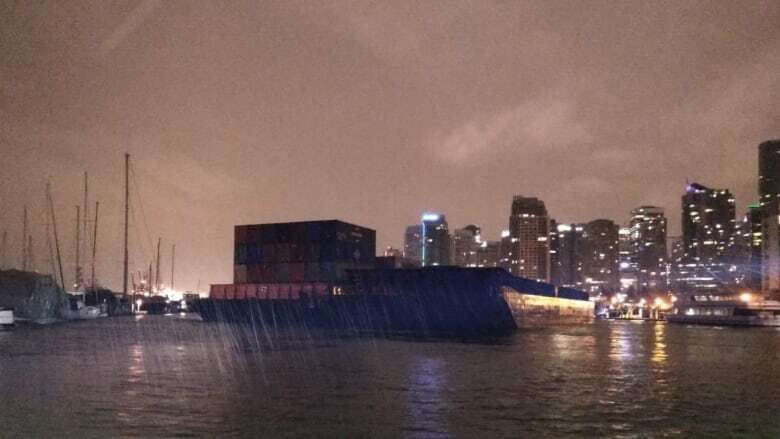 The barges, which were tied together and carrying shipping containers, damaged a seaplane base, a local restaurant and two luxury yachts in the Coal Harbour Marina. "Fortunately, there were no injuries reported," said Robillard. VPD's marine unit received a 911 call around 6:30 a.m. Wednesday regarding the floating barges, Robillard said. Two local tugboats, two Port of Vancouver vessels and a VPD marine unit vessel managed to pull the barges back to North Vancouver just after 8 a.m.
Vancouver police are investigating the the extent of the damage while the Transportation Safety Board investigates the cause. Mohan Raman, operations manager for marine investigations at the Transportation Safety Board, told CBC News the barges were owned by two marine transportation companies, North Arm Transportation and Mercury Launch and Tug Ltd.
"We are still gathering information at this point and we don't know the cause as to why the barge drifted or came out of its mooring," said Raman. CBC News contacted both companies but they have yet to respond. One of the structures that suffered damage was the Lift Bar and Grill, a restaurant located next to the harbour. 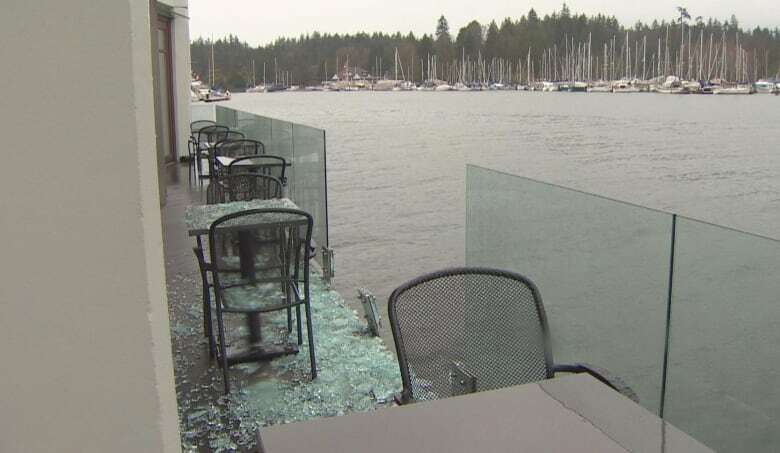 Restaurant manager Claire Clarke told CBC News two glass panels on the restaurant's patio were smashed as a result of the impact. Clarke said the restaurant's engineers will assess the damage and the owners will be looking into making an insurance claim.